During any procedure that requires any sedation or anesthesia we have a multitude of safety measures which we follow to keep our patients as safe as possible during and after the procedure. 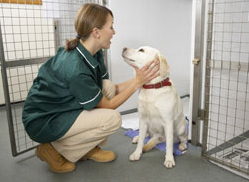 The veterinarian will perform a full pre-surgical physical examination to ensure your pet is healthy. The veterinarian will listen to your pet’s heart and lungs to ensure they do not have issues such as heart murmurs, heart rhythm abnormalities or respiratory system issues. They will assess their hydration, alertness, palpate their abdomen for organ abnormalities. Once we have ensured the health of your pet, we will perform any necessary blood work prior to sedating them. This will assess their organ function (liver and kidneys) as well as check for anemia, dehydration and blood glucose levels. Your pet is placed on IV fluids prior to receiving sedation to support their organ function, keep them well hydrated and maintain a normal blood pressure throughout the procedure. A Registered Veterinary Technician (RVT) will continually assess your pet’s heart rate, rhythm, respiratory rate, blood pressure and other vital signs to continue to ensure the safety of your pet. We use sophisticated equipment to monitor your pet’s heart rate and rhythm as well as blood pressure.